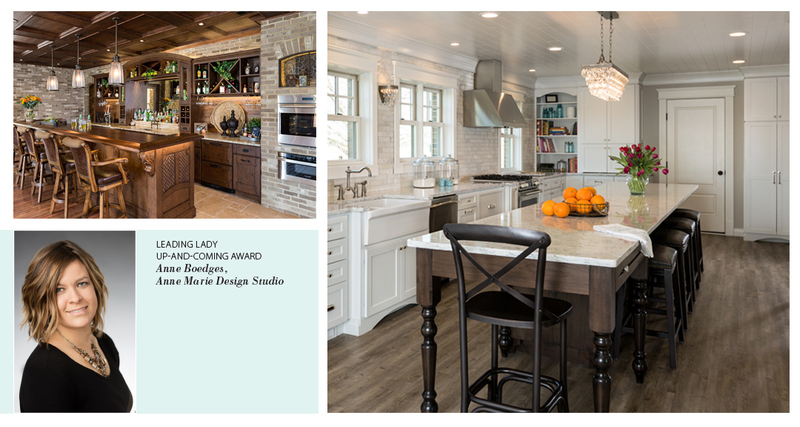 Anne Boedges established Anne Marie Design Studio in 2013 after being in the kitchen and bath industry for 15 years. With a bachelor of fine arts in interior design from Maryville University, Anne has the talent to make every project efficient as well as beautiful. Anne was selected as the Midwest Region Designer for The Tile Shop where she was featured in their annual holiday design book. She was an NKBA Bath Certification instructor at Meramec for two years and is a member of the local NKBA chapter. When not designing innovative and functional spaces, Anne contributes to several local charities and organizations. She has volunteered as the decorator for a large charity auction, was a mentor for the Junior Robotics Club and serves on the Parent Teacher League at St. John’s Lutheran School. Anne is an up-and-coming leading lady for her ability to come up with beautiful design solutions for the most challenging spaces. Anne: When I was in Maryville University’s Business of Interior Design class, our teacher, Les Armontrout, asked for a raise of hands for who wants to own their own company; I think I was the only one who raised her hand! I was always inspired by small business owners, as well as large interior design firms such as HOK. Anne: I have a tendency of wanting to do it all, and then some. So I work myself crazy busy to get there. I learned pretty quickly that I needed an assistant and an office coordinator to achieve my goals successfully. A huge goal of mine is to prove that a female, eternal optimist doesn’t have to change her upbeat, cheerful personality to get what she wants in life. Anne: The most rewarding feeling is the ability to build real relationships with my clients, to where they almost become family. Anne: Follow your dreams! And get the best help to back you up! You can’t do anything completely by yourself. We here at Anne Marie Design Studio love doing projects as a team. There are so many facets to each project, and having multiple eyes looking and helping with different aspects catches issues before there are any, and gives our client THE best design process possible! The outcome can be unimaginable for most clients without the strength of our team.